I am in the process of re-finishing some 50+ year old Cedar Kitchen Cabinets. After using a belt sander to remove 50+ years of cooking goo, and whatever other finish they may have had on them in the past. The Lady owner just LOVES the awesome light color and pretty grain they have on them when un sealed. Just sanded. But even after just applying a neutral colorless sanding sealer to them,, they get a LOT darker. see the image. Is there any way that I can seal them yet keep the lighter color. in 50+ years, if there is,, it is news to me. anyone? ICA!! Only the Italians produce a 'natural' wood coating. Trust me, I have tried to find one made in the USA....next best is MLC Agualente or Zenith by Valspar. Where can I get some of this here in the states? Another supplier of quality waterborne finishes is Target Coatings. Their super clear poly is a good choice - see link below. ICA Coatings has lots of distributors in the US. Link attached. We are using the ICA waterborne sealer and top coat. It requires some fine tuning of the gun and the employee but its so worth it. If you are going to try WB, then take a wet cloth and rub it into a test piece and that is going to give you somewhat of an indication what to expect. Most likely even WB are going to end up darker than you want and that is part of the process of the coating being absorbed into the cedar. Not sure if this will work or not but what you are trying to do is add a protective coating without having it penetrate into the wood fibers and that is tough to pull off. I would try to set up my spray gun to mist several light coats on the surface to just dust it and see if you can get enough of a layer on there to seal the surface and prevent future coats from soaking in, then use the products above. Use a dull sheen. I just tried just some plain water as suggested to see what the tone would be like. Being Cedar,,,, And the rest of this house inside is Cedar, "No finish at all, I wonder how long they would stay looking like they do, if I was to sand them clean, and polish samd them all the way down to 400 or 600 grit and then just left them bare, How long do you think they would stay this way. This is something I have never ever done also. hmmmmm?
" Cooking goo " on soft and raw Cedar does not sound appealing. i get this request alot. customer wants the wood to look like it does when theres no finish applied. the closest ive come is with dead flat water white lacquer. I use t67f6 vinyl sealer diluted 40% to seal it. Sprayed on very lightly. Just enough to pass as a coat. Then i add 8 ounces of universal gloss modifier paste per gallon of t77f83 water white lacquer. Looks unfinished... but not sure how it would hold up in a kitchen. Wetting the wood with water will not give you a good representation of how it will look if you apply a waterborne finish. 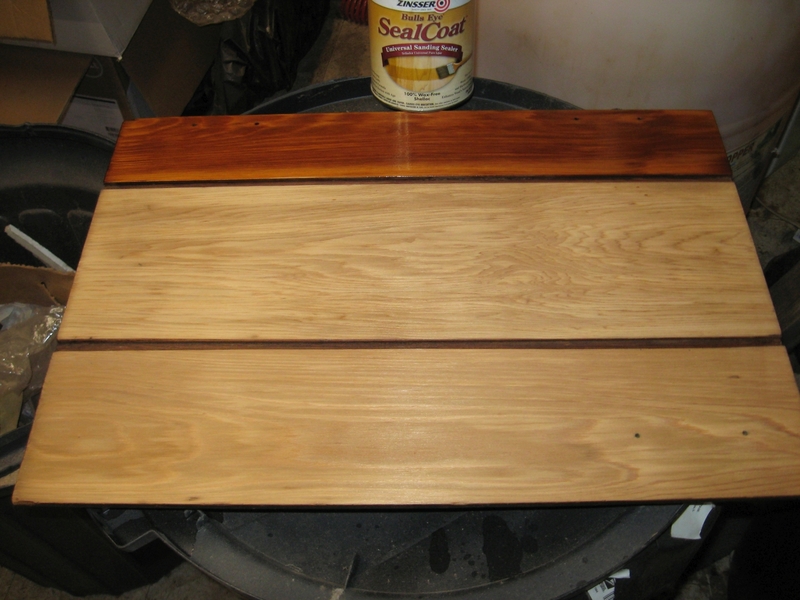 Before it evaporates, water will make the wood look similar to the result a solvent based clear coat will produce. Using a waterborne finish to retain the natural look of the wood as much as possible is a good choice. I'd recommend you do a sample to evaluate the results. Kevin's recommendation to use a flat finish is a good approach to make the wood look unfinished, but solvent based finishes do wet the wood fibers well and make it look darker. Many waterborne finishes do not wet the wood as well and the color is more natural. Making waterborne finishes produce the "warm" look of solvent based finishes is a specific characteristic that the formulators have been making improvements on for a number of years. I've contacted the couple companies about trying to find some or samples I don't want a whole gallon yet, or would need even. so anyone make a suggestion of something like from menards, home depot, sherwin williams etc.? Check with your local Sherwin Williams to see if they have Kem Aqua I have used it a number if times on furniture with good results (the "dull rubbed" sheen looks good). If you use it with the sealer, it passes KCMA testing for durability (see attached data sheet). But then again if i use it with that sealer, then I'm back to dark again. The sealer is also waterborne. Sampling is your best bet at this point. Owner finally decided to try going au natural. In other words sand them down, and leave then as is. And see how long they stay nice looking. Should be interesting. The whole house inside is un finished Cedar too and it is only slightly darker than the sanded stuff. Even after all those years. So should be an interesting experiment. Thanks everyone for all the sugestions.